SPEAKING on Wednesday in the European Parliament on the outcome of the Lisbon Treaty, Sinn Féin MEP Bairbre de Brún highlighted the momentous opportunity available to re-open the debate about the future of Europe. “The vote that Irish people cast against the Lisbon Treaty last Thursday was not a vote against the EU. Ireland’s place is in the EU. The Lisbon Treaty was put before people in Ireland and it has been rejected. The Lisbon Treaty is over. Irish citizens like those in France and the Netherlands, want a better deal”, de Brún said. “We now have an enormous opportunity to re-open the debate about the future of Europe. We must embrace this opportunity. It would not be acceptable for EU leaders to seek ways of avoiding or circumventing the democratically expressed wishes of Irish people. The ratification process must stop just as it did following the rejection of the EU Constitution. But on this occasion EU leaders must listen to what Irish people have said. Many of the same themes came up in Ireland as were raised in France and in the Netherlands. “Throughout the referendum campaign in Ireland a number of key issues came up over and over again – the democratic deficit, Ireland’s loss of power and influence in Europe, neutrality and non militarisation, workers’ rights and public services, and the treaty’s impact on the developing world. These issues must be addressed. 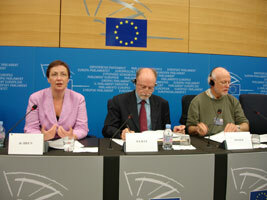 “The European project is now put to the democratic test through its response to the vote in Ireland. Does it listen to the people, does it respect their democratic wishes or does it alienate citizens by setting all of that aside? “Democracy must prevail’, the Sinn Féin MEP said.